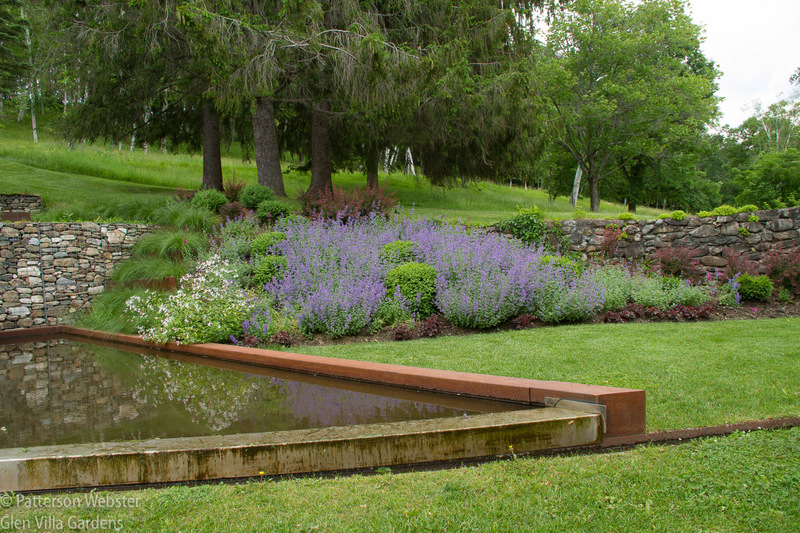 This week the first group of gardeners will be coming to tour Glen Villa. Forty plus members of the Ottawa Garden Club will spend the morning here, on what I’m hoping will be a sunny day. They are coming at a good time — the garden is looking fabulous. I rarely write a blog post that’s only about flowers, but this week the blooms are so spectacular that it’s worth showcasing their beauty. The Aqueduct, where last year I added Nepeta ‘Walker’s Low’, Ruby Carousel barberry and Porteranthus (formerly Gillenia trifoliata) to existing boxwood balls, is stunning, a symphony of blue and green. 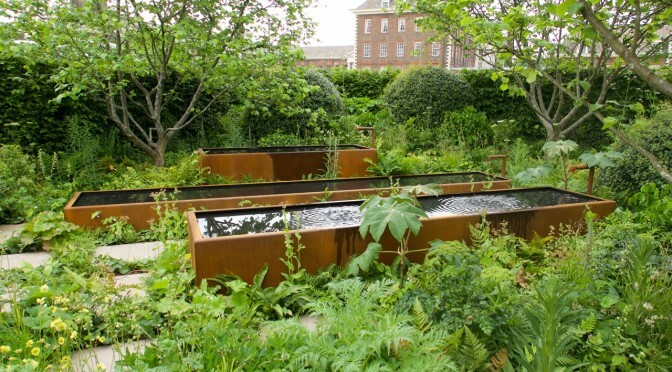 I want to add a tall spiky plant that pops up through the Nepeta at occasional spots and tones in with the barberry and rusty steel. I’m trying several possibilities this year and have ordered early summer blooming Eremurus ‘Cleopatra’ to try next year. 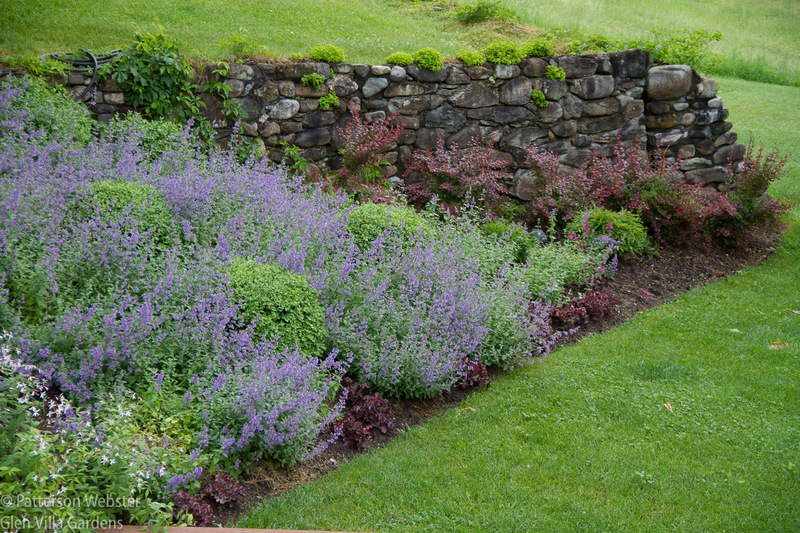 A close-up shows how the nepeta is almost overwhelming the boxwood. I’m wondering how much I’ll have to cut back in the future. But for now, I’m happy with the balance. I plan to add another clump of Porteranthus (Gillenia trifoliata) at the far corner to echo the clump of white shown in the photo above. I love the colour of these blossoms and the perky way they stand up above the foliage. 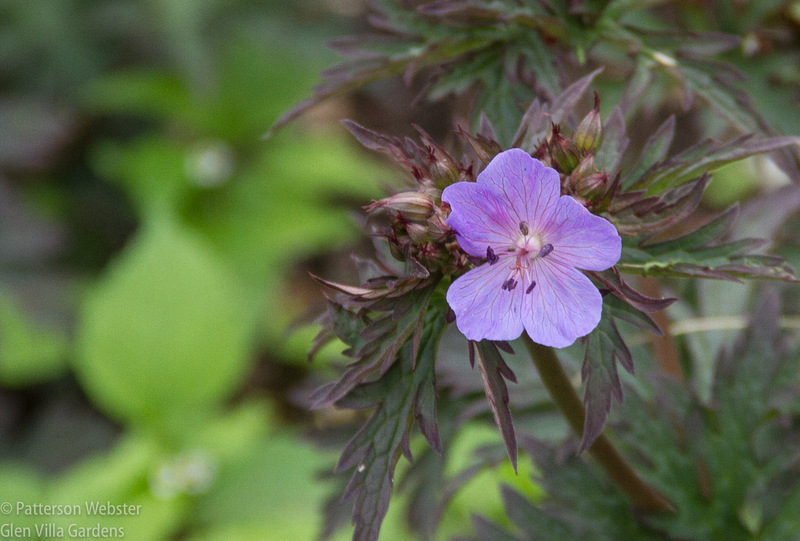 ,,, while Geranium ‘Hocus Pocus’ brings a touch of dark magic to the scene. 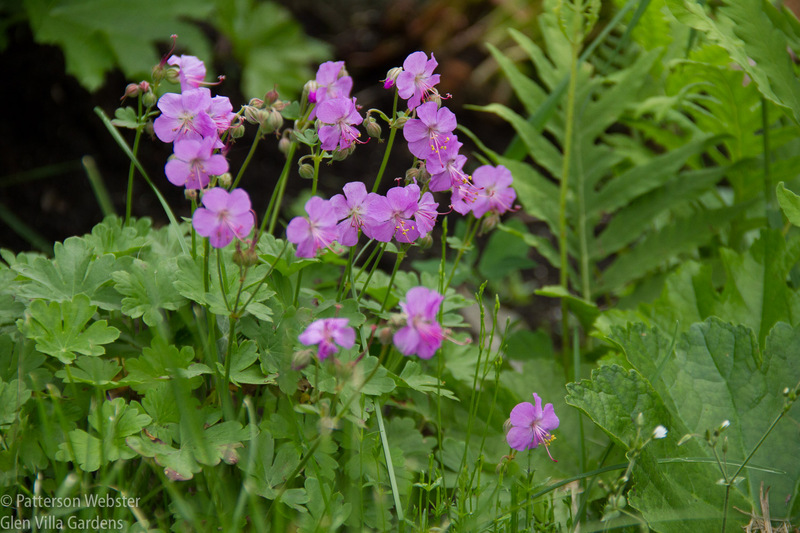 I wasn’t sure these geraniums would survive the winter in this often damp location, but they have. And soon the plants should be covered with blossoms. 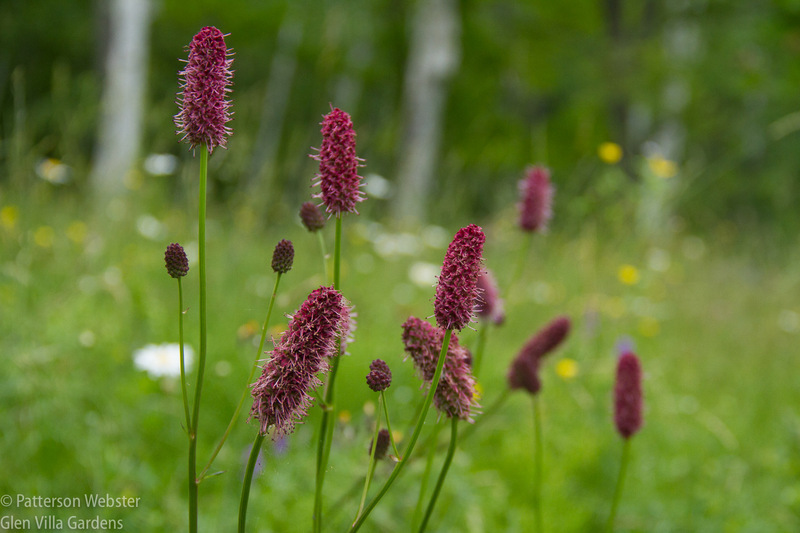 Near them are plants I started from seed about a dozen years ago, Sanguisorba menziesii. I love the bottlebrush shape and the fabulous burgundy colour. Hmm… maybe these burnets would work in the Aqueduct border. But would they carry enough weight to balance the explosion of Nepeta? What do you think? 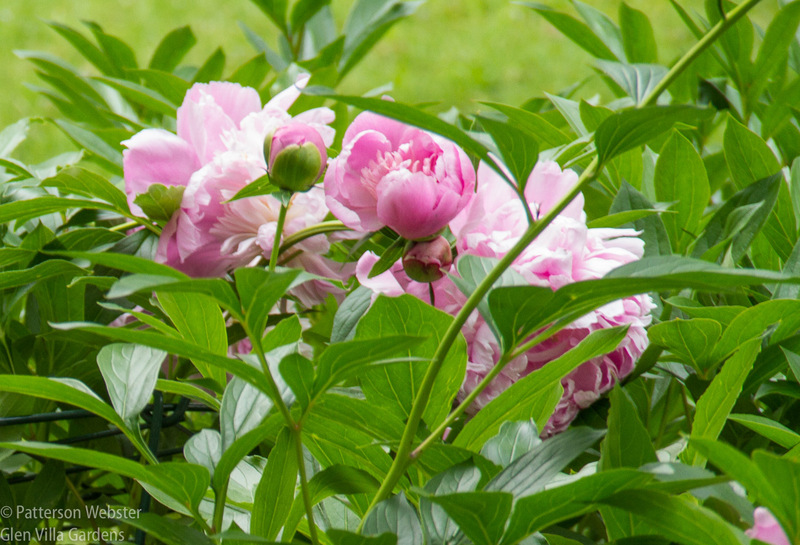 In the Lower Garden, the pink peonies are luscious. So are the double white. 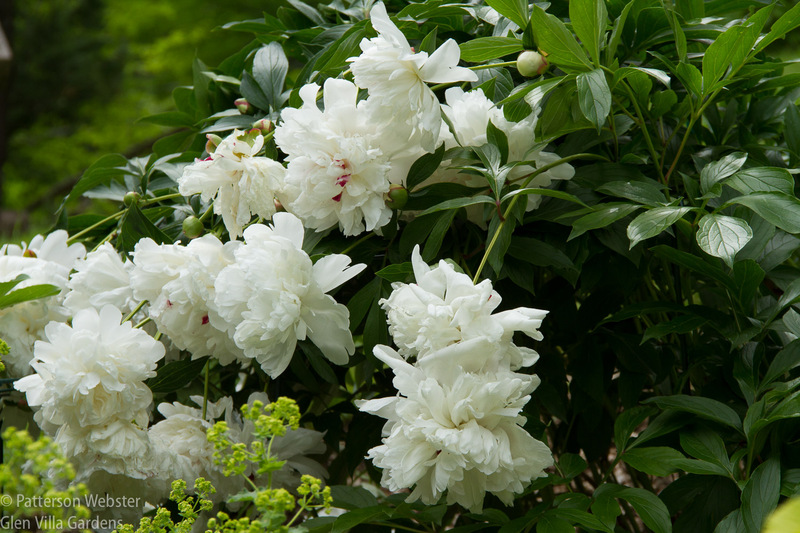 I like any colour of peony. I like the foliage, too. 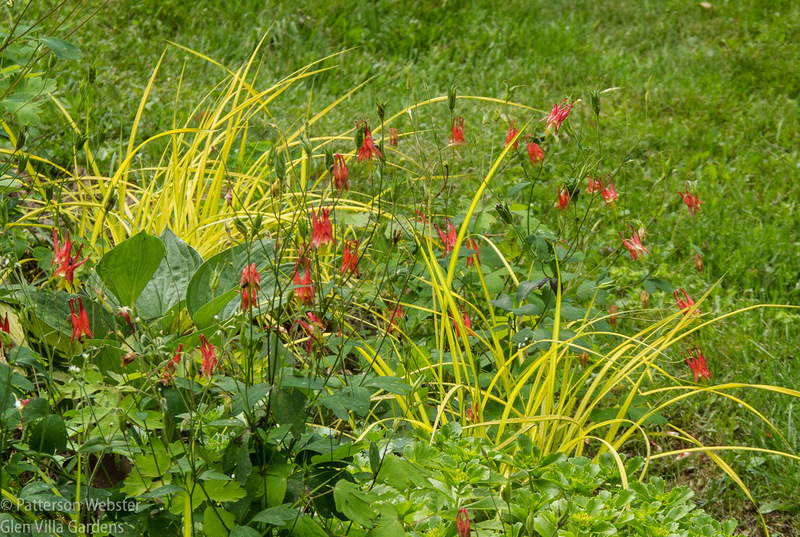 The Acquilegia canadensis are staying true to themselves, and offer a punch of colour in combination with ‘Bowles Golden’ carex. This combination is growing close to a mustard-coloured Chinese vase. The colours work really well together. 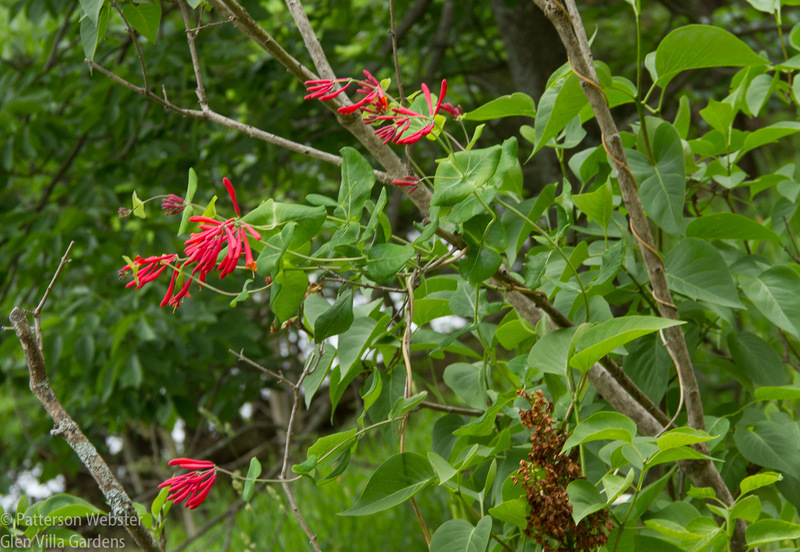 I don’t have much bright red in the garden, but seeing this honeysuckle in bloom, that may change. I planted this honeysuckle (Lonicera sempervirens ‘Major Wheeler’) in 2012. This is the first year it has bloomed. 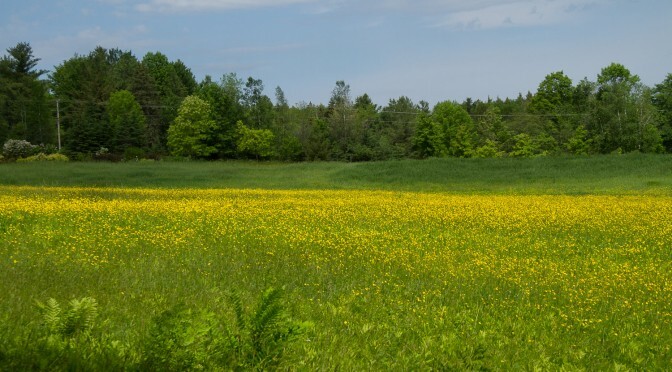 Is a warmer climate the reason? 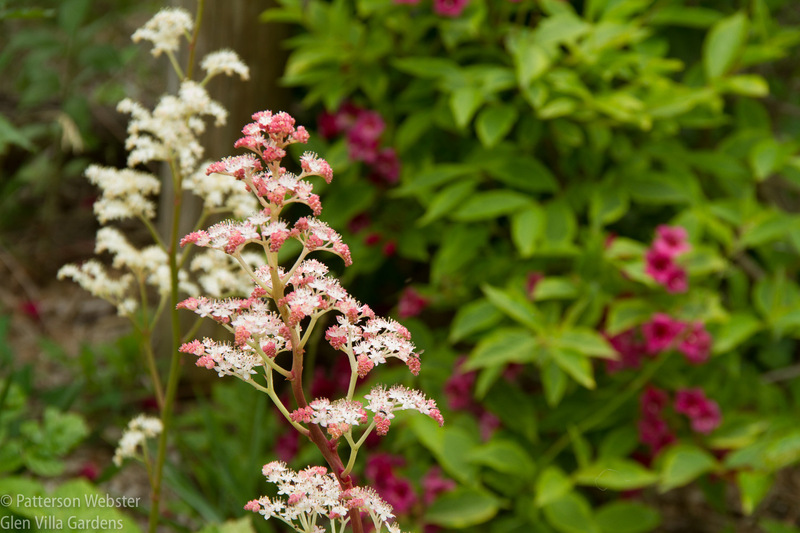 In the same bed a fingerleaf Rodgersia (Rodgersia aesculifolia) is a standout against a pink-flowered weigela (Weigela florida ‘French Lace’). This Rodgersia is pink around the edges… I haven’t noticed that on the plants before this year. And not all of the fingerleaf Rodgersias share this colouring, but over half of them do. By the front door, the Anemone canadensis I added last year is doing exactly what I hoped it would do, shining a spot of light in the shade of a pine tree. 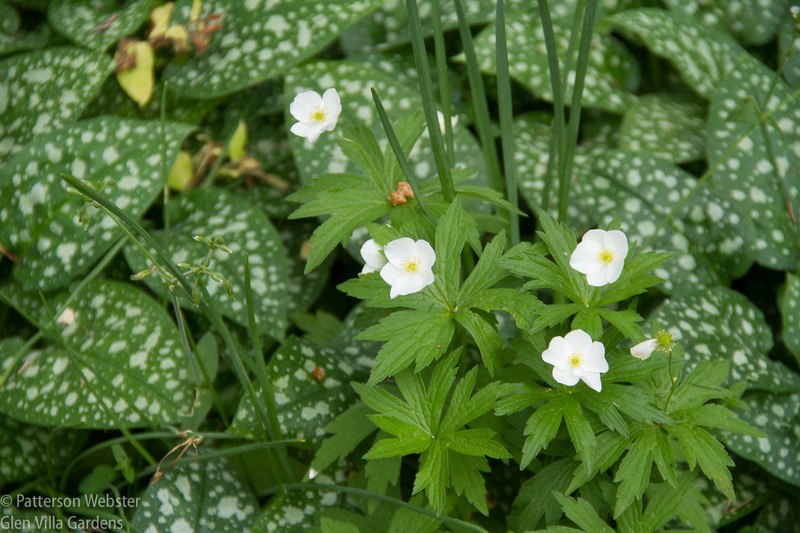 The white spots on an old-fashioned pulmonaria, variety unknown, are set off by the white blossoms on the Anemone canadensis. The anemone should self-seed and spread. The display is wonderful now and should continue for weeks. Next to come, I think, will be the astilbe in the Lower Garden. Even now, tightly closed, the promise is unfolding. 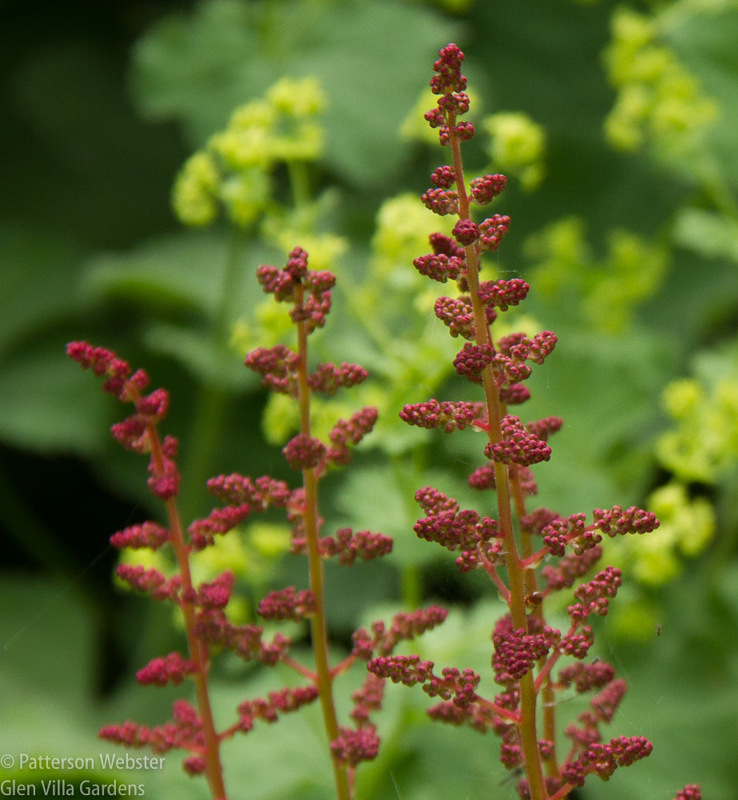 The deep red of Astilbe Fanal is set against the citrus blooms of lady’s mantle. Both are just beginning to bloom. 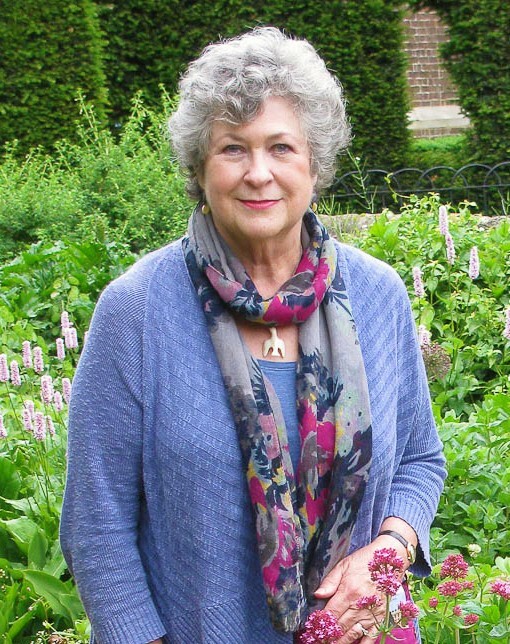 I plan to challenge the members of the Ottawa Garden Club by asking them a few questions. I didn’t think up the questions, I’ve pinched them from one source or another. They seem to be good questions for gardeners anywhere to ask, about their own garden and any garden they visit. 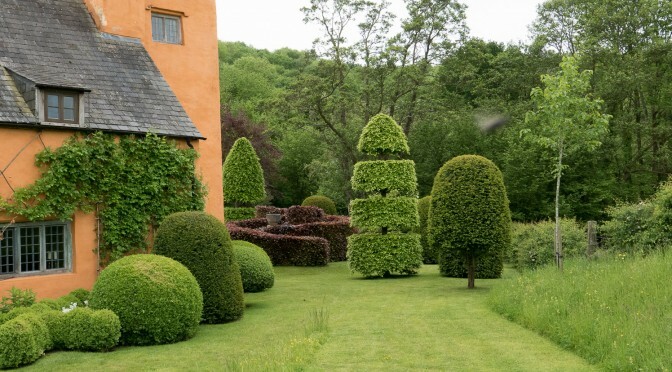 What one thing in the garden would you change? Is there something you’d add or delete? And would you like this garden to be yours? I hope they send me their answers. Honest criticism is a good way to learn.